Very good tool for all kinds of stuff. Worth having, dead cheap. The Migrolino Shell in Seefeld will remove the old one(s) and stick the new one if you buy the vignette there. First learned about this when the guy offered to remove all the old vignettes (we never remove them ourselves) last year. This year I actually had to ask the lady but she was happy to do it. 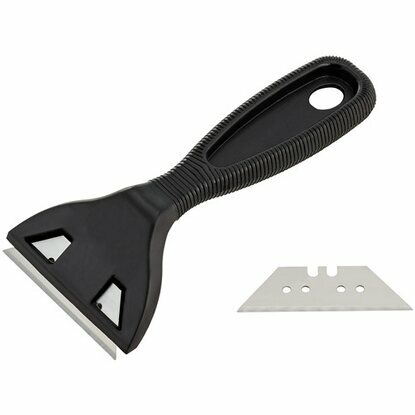 It’s a razor scraper or simply a scraper. Do you mount your summer tires in January or do you first drive the autobahn in summer? Just wonder how did they get their licenses in the first place, if they cannot remove simple sticker. Didn´t know that that was a condition for a driving licence? One could be even fined if the old vignette has not been removed. Unless it obstructs one's vision that's not going to happen. Reminder to put your vignettes on before hitting the freeway tomorrow. The police are often out in force during the first week of February. They lurk at the entrances and exits to the freeways, stopping cars and handing out tickets - at least in Bern/Fribourg. I unfortunately stuck mine behind the shaded bit (which is clear from the inside looking out). I managed to remove and relocate it with a hairdrier and razor blade (not Stanley) held in a pair of pliers. I did have the scraper pictured earlier but that’s way too brutal for a reclamation and doesn’t have any give in it for a curved screen. There is a deap dark secret to removing a vignette in one piece.